The Nature Reserve of Tianzi Mountain, acclaimed as “the Gem of forests and Peaks” is one of the scenic highlights in the Scenic Area of Wulingyuan. 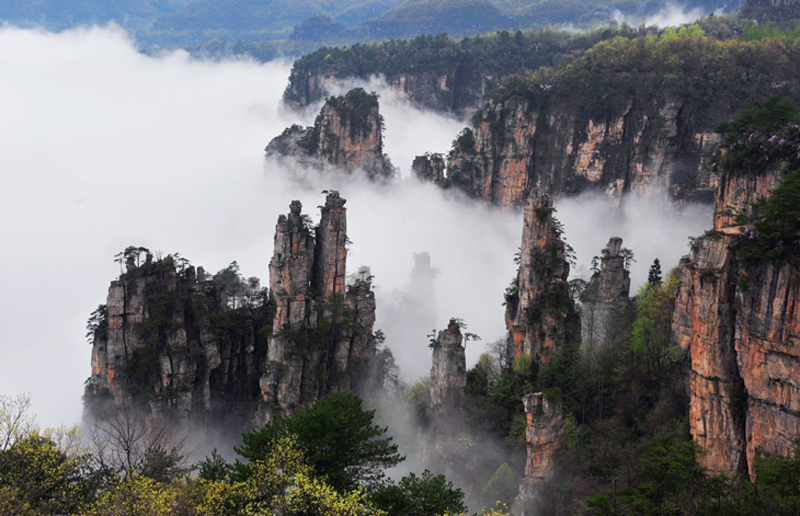 Tianzi Mountain has the peculiar landform, which is called “the peak forest of quartzose sandstone” As demonstrated by science, about three hundred million years ago; it was a vast sea here. About one hundred million years ago, as the result of lash by sea waves, quartzose sandstone deposited over 500-meter thick on the sea floor. Later, this place became dry land after the strong rise by the new structure movement. When the land surface rose, with the action of flowing water, some small sands and stones were washed away. Besides, rocks collapsed under the action of gravity, and were washed slowly by rainfalls and streams. All these factors have made Wulingyuan area a rocky and woody landform of peculiar quartzose sandstone. Shentangwan of Tianzi Mountain is the most mysterious spot on the Scenic Area of Wulingyuan. Shentangwan has nine levels of rock. Someone once ventured into the valley only to return when he was absolutely horrified on the fourth level of approximately 150 meters deep, hearing howling winds accompanied by mournful shrills from the valley enshrouded in total darkness. In 1968, the PLA soldiers planed to cull glossy ganoderma and other rare medical herbs in the valley. Bearing guns and slings, they went down the valley. Again, they went down the valley. Again, they were forced back when they reached the sixth level. Even seen from there, the valley looked horrible and bottomless. Since then, Shentangwan has become a world of mysteries and no man has set foot in it. The He Long Park of Tianzi Mountain is the only cultural site on a big scale in Wulingyuan. Entering the park, one comes in sight of the Bronze Statue of He Long. The statue stands 6.5 meters high, weighing up to nine tons. It is one of the largest and heaviest statues of the great people of China in the past hundred years. The scenery of Tianzi Mountain holds a fascination for tourists and the people here are simple and honest. Tianzi Mountain has more scenic sights to offer than eye can take in and has too many stories to tell. 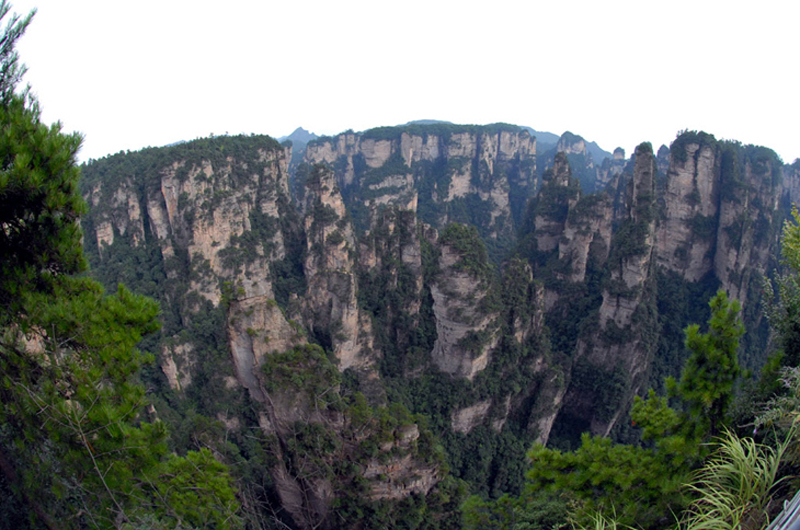 Small wonder people make comments on the mountain to the effect that “Tianzi Mountain is beyond exploration. After touring the mountain, you shall take no interest in seeing any other mountains”.